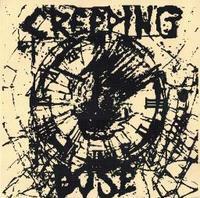 Man In Decline Records - Creeping Dose - "s/t" 7"
Creeping Dose - "s/t" 7"
After a well-regarded demo tape here's the debut vinyl from NYC's Creeping Dose. I guess that, on the surface, this sounds like a lot of other recent NYC punk... it's certainly raw and nasty and the packaging is very much in the vein of the Toxic State stuff, but Creeping Dose kind of have their own thing going on. The fast parts are kind of loose (almost to the point of being sloppy), reminding me of bands like Wretched, but they're not loud-and-fast all the time... they also have a creepy post-punk element that kind of reminds me of some of the earlier Anasazi stuff. They also have a really good grasp of songwriting dynamics, which I've always thought was a hallmark of the NYC bands. If you're really into the Warthog / Ajax end of the scene I could see this being too sloppy for you, but if you're more into Crazy Spirit / Dawn of Humans / etc. this is going to be right up your alley.